Thomas Ward (1813-1879), our third great-grandfather, was born in Oxfordshire near Witney around 1813. He was the son of James Ward, a labourer. I had previously researched Ward families in Oxfordshire to find his family of origin. For this research see: Oxfordshire Wards Part I: Thomas Ward, son of James. Which James? Although I did not find Thomas Ward’s baptism record, I narrowed down the list to those families that could possibly be his. 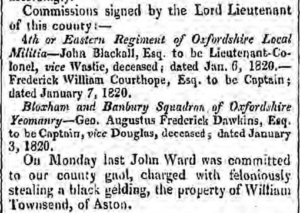 Of the several James Ward families living in Oxfordshire at this time, one has the most in common with the details provided in records for Thomas Ward. James Ward (1771-1840) a labourer living in Aston and Cote near Bampton is the most likely father of Thomas Ward. 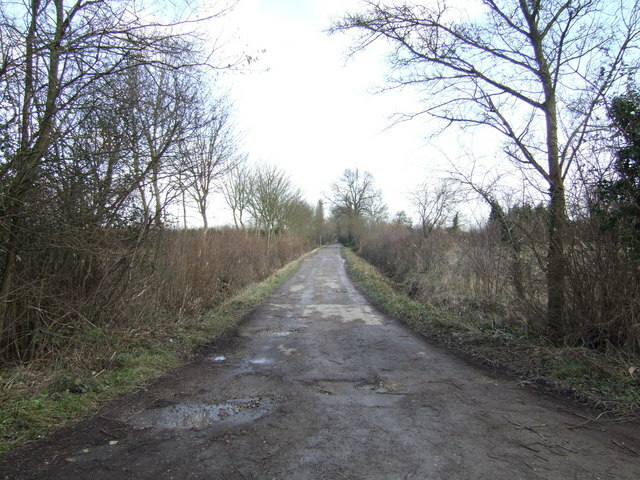 There also may have been another James Ward in Oxfordshire at the time who left no record. Here I will provide more detail about the family of James Ward of Aston and Cote. 1. James Ward was born in 1771 at Aston, Oxfordshire, England, the son of James Ward and Jane Smallbones. He was baptized on 9 Mar 1771 at St. Mary the Virgin, Bampton, Oxfordshire, England. He died on 17 Dec 1840 at Cote, Oxfordshire, England, and was buried on 20 Dec 1840 at St. James Church, Aston, Oxfordshire, England. 1.1. Ann Ward, b. 1797, baptized 02 Jul 1797 at Saint Giles Church, Oxford, Oxfordshire, England. 1.2. Mary Ward, b. 1800 at Aston, Oxfordshire, England. Baptized 12 Apr 1800 at St. Mary the Virgin, Bampton. d. Oct 1801 at Aston, Oxfordshire, England. Buried 09 Oct 1801 at St. Mary the Virgin, Bampton. 1.3. John Ward, b.1802 at Aston, Oxfordshire, England. Baptized 24 Jan 1802 at St. Mary the Virgin, Bampton. d. before 1831 in England. +1.4. Mary Ward, b. 1804 at Aston Oxfordshire, England. Baptized 18 Mar 1804 at St. Mary the Virgin, Bampton, Oxfordshire, England. d. 12 Sep 1888 at Belleville, Hastings, Ontario, Canada. Married: Philip Cox (son of Philip Cox and Ann Abraham) on 14 Feb 1822 at St. Mary the Virgin, Bampton. Had Issue. 1.5. Maria Ward, b. 1806 at Aston, Oxfordshire, England. Baptized 06 Apr 1806 at St. Mary the Virgin, Bampton. +1.6. James Ward, b. 1808 at Aston, Oxfordshire, England. Baptized 17 Jul 1808 at St. Mary the Virgin, Bampton. 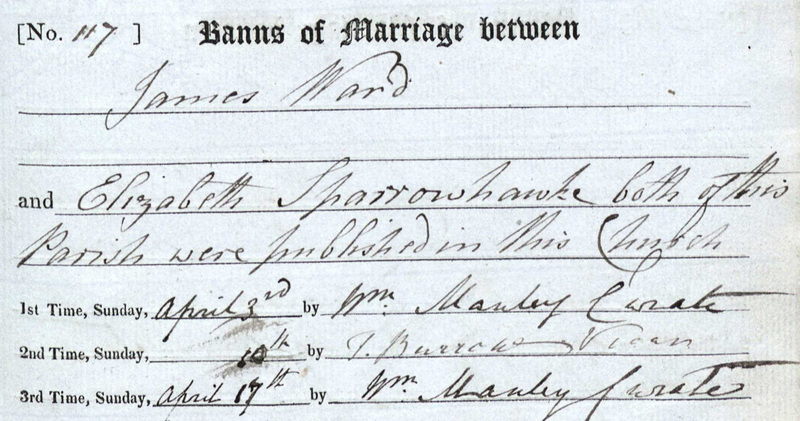 Posted marriage banns with Elizabeth Sparrowhawk (daughter of Thomas Sparrowhawk and Sarah Sparrowhawk) on 3, 10 and 17 Apr 1830 at St. Mary the Virgin, Bampton, but did not marry. Had issue. 1.7. Jane Ward, b. 1810 at Aston, Oxfordshire, England. Baptized 09 Sep 1810 at St. Mary the Virgin, Bampton. d. Oct 1810 at Aston, Oxfordshire, England. Buried 22 Oct 1810 at St. Mary the Virgin, Bampton. +1.8 George Ward, b. 14 Jun 1814 at Cote, Oxfordshire, England. Baptized 17 Jul 1814 at St. Mary the Virgin, Bampton. d. 7 May 1901 at Mundy, Genesee, Michigan, USA. Married: Mary Bridget McCann (daughter of John McCann) on 16 Sep 1839 in Mortlake, Surrey, England. Had Issue. 1.9. Philip Joseph Ward, b. 1820 at Cote, Oxfordshire, England. Baptized 17 Sep 1820 at St. George’s Roman Catholic Chapel, Buckland, Berkshire, England. d. Jul 1836 at Cote, Oxfordshire, England. Buried 30 Jul 1836 at St. Mary the Virgin, Bampton, Oxfordshire, England. 1.10. Jane Ward, b. 1822 at Cote, Oxfordshire, England. Baptized 4 Aug 1822 at St. George’s Roman Catholic Chapel, Buckland, Berkshire, England. d. Apr 1836 at Cote, Oxfordshire, England. Buried 27 Apr 1836 at St. Mary the Virgin, Bampton, Oxfordshire, England. 1.11. Elizabeth Ward, b. 1824 at Cote, Oxfordshire, England. Baptized 24 Oct 1824 at St. George’s Roman Catholic Chapel, Buckland, Berkshire, England. d. Mar 1836 at Cote, Oxfordshire, England. Buried 23 Mar 1836 at St. Mary the Virgin, Bampton, Oxfordshire, England. 1.12. Job Ward, b. 1827 at Cote, Oxfordshire, England. Baptized 28 Apr 1827 at St. George’s Roman Catholic Chapel, Buckland, Berkshire, England. d. unknown. +1.13. Alfred Ward, b. 17 Jan 1829 at Cote, Oxfordshire, England. Baptized 3 May 1829 at St. George’s Roman Catholic Chapel, Buckland, Berkshire, England. d. unknown. Had issue with Hannah Wadhams Mee, daughter of William Wadhams and legal but separated wife of Thomas William Mee. 1.14. John Ward, b. 1831 at Cote, Oxfordshire, England. Baptized 06 Jan 1832 at St. George’s Roman Catholic Chapel, Buckland, Berkshire, England. d. 23 Aug 1840 at Cote, Oxfordshire, England. Buried 25 Aug 1840 at St. James’ Church, Aston, Oxfordshire, England. +1.15. David Ward, b. 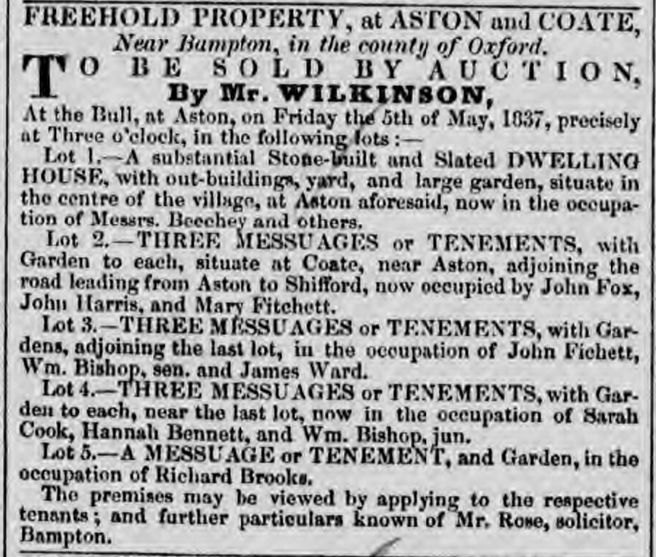 20 Mar 1835 at Cote, Oxfordshire, England. Baptized 26 Apr 1835 at St. George’s Roman Catholic Chapel, Buckland, Berkshire, England. d. Jul 1884 at Witney, Oxfordshire, England. Buried 12 Jul 1884 at St. Mary’s Church, Witney, Oxfordshire, England. Married: Louisa Clements on 02 Mar 1875 at the Register Office in Witney, Oxfordshire, England. Had issue. 1.16. Jane Ward, b. 11 Nov 1838 at Cote, Oxfordshire, England. Baptized 17 Jan 1839 at St. George’s Roman Catholic Chapel, Buckland, Berkshire, England. d. unknown. John Ward (1802-?) 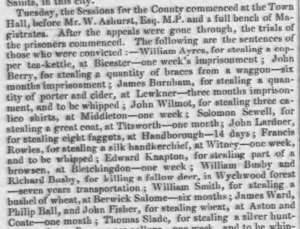 appears briefly in records of the Oxfordshire Lent Assizes of 1820 where he was charged with stealing a black gelding from William Townsend of Aston.6 After being committed to the County Gaol,7 he was released. His case was dismissed by proclamation.8 John does not appear in any records after this point. James Ward (1771-1841) had another son named John with his second wife Teresa in 1831, so it is reasonable to assume the first John Ward (1802) died between 1820 and 1830. On Monday last John Ward was committed to our county gaol, charged with feloniously stealing a black gelding, the property of William Townsend, of Aston. 1.4.1 Ann Cox, b. before 28 Jan 1822 in Cote, Oxfordshire, England. d. 20 Mar 1848 at Belleville, Hastings, Ontario, Canada. Married: Archibald Newlands Menzies on 12 Feb 1839 at Hastings, Ontario, Canada. +1.4.2 Philip Cox, b. 14 Feb 1824 at Buckland, Berkshire, England. d. 18 Oct 1907 at Belleville, Hastings, Ontario, Canada. Married: Emelia A. Lawrence on 07 Jan 1850 at Belleville, Hastings, Ontario, Canada. Had issue. 1.4.3 William Cox, b. 1826 at Buckland, Berkshire, England. Baptized 19 Mar 1826 at St. George’s Roman Catholic Chapel, Buckland. d. 1830, buried 15 May 1830 at Buckland, Berkshire, England. +1.4.4 John Cox, b. 6 Jun 1828 at Buckland, Berkshire, England. d. 01 Dec 1897 at Gaylord, Otsego, Michigan, USA. Married: Ellen Duffy on 18 Jul 1854 at Belleville, Hastings, Ontario, Canada. Had issue. 1.4.5 Francesca Constable Cox, b. 28 Dec 1830 at Buckland, Berkshire, England. d. 1831, buried 05 Apr 1831 at Buckland, Berkshire, England. 1.4.6 Emma Cox, b. 2 Jan 1832 at Buckland, Berkshire, England. +1.4.7 Emily Rose Cox, b. 1835, baptized 25 Jan 1835 at St. Michael the Archangel in Belleville, Hastings, Ontario, Canada. d. 29 Jan 1915 at Hastings, Ontario, Canada. Married: James Cummins about 1857 in Hastings, Ontario, Canada. Had issue. +1.4.8 James Cox, b. 1837, baptized 17 Mar 1837 at St. Michael the Archangel in Belleville, Hastings, Ontario, Canada. d. 20 Dec 1911 at White Salmon, Klickitat, Washington, USA. Married: Eliza Lennon on 28 Apr 1858 at St. Michael the Archangel in Belleville, Hastings, Ontario, Canada. Had issue. +1.4.9 Thomas Cox, b. 1839, baptized 28 Mar 1839 at St. Michael the Archangel in Belleville, Hastings, Ontario, Canada. d. 29 Jul 1916 at Wentworth, Ontario, Canada. Married: (1) Mary Elizabeth Ryan on 19 Jan 1863 at St. Michael the Archangel in Belleville, Hastings, Ontario, Canada. Married: (2) Bridget Hendrickson on 21 Jul 1878 at St. Michael the Archangel in Belleville, Hastings, Ontario, Canada. Married: (3) Elizabeth Moore on 20 Oct 1890 at St. Michael the Archangel in Belleville, Hastings, Hastings, Ontario, Canada. +1.4.10 David Cox, b. 11 Jan 1841 baptized 14 Feb 1841 at St. Michael the Archangel in Belleville, Hastings, Ontario, Canada. d. 27 Feb 1916 at East Bay, Grand Traverse, Michigan, USA. Married: Eliza Jane McSherry about 1866 in Michigan. Had issue. +1.4.11 Maria Cox, b. Feb 1848, baptized 26 Apr 1848 at St. Michael the Archangel in Belleville, Hastings, Ontario, Canada. d. Aug 1874 at Belleville, Hastings, Ontario, Canada. Married: William Wilkinson on 09 Jul 1871 at St. Michael the Archangel in Belleville, Hastings, Ontario, Canada. Had issue. +1.4.12 Daniel Joseph Cox, b. 14 May 1852, baptized 27 Jun 1852 at St. Michael the Archangel in Belleville, Hastings, Ontario, Canada. d. 27 Mar 1923 at Saginaw, Saginaw, Michigan, USA. Married: Mary Emma Leduc on 07 Jan 1875 at St. Michael the Archangel in Belleville, Hastings, Ontario, Canada. Had issue. 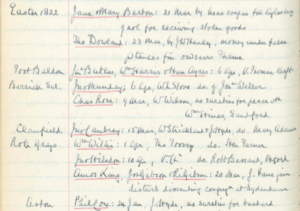 James Ward and Elizabeth Sparrowhawk of Aston posted thrice their Marriage Banns at St. Mary the Virgin in Bampton on April 3rd, 10th, and 17th of 1830. However, they never married. James went on to father at least two children by Elizabeth Sparrowhawk: Mary Ward Sparrowhawk (1830) who died in childhood, and Harriet Ward Sparrowhawk (1831). 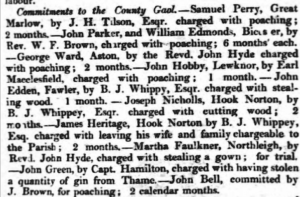 In 1831, the Justice of the Peace threw James Ward a baby shower at the Witney Petty Sessions.14 Gifts included one bastardy conviction and three months of hard labour in the House of Correction.15 Elizabeth Sparrowhawk gave birth to three more children in Aston: Jacob, Sarah, and Mary Ann, but for these she listed no father in the baptismal register. 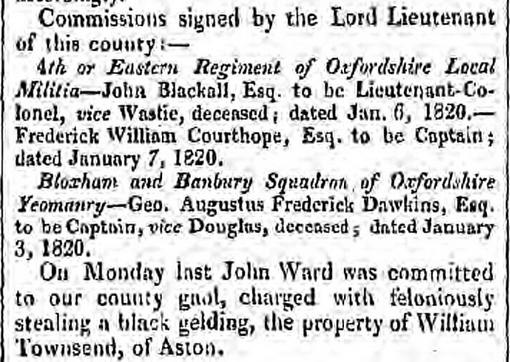 I could find no record of James Ward (1808) after his imprisonment for bastardy in 1831. He may have been the father of Elizabeth Sparrowhawk’s remaining children, and changes in the Bastardy Law in the 1830s could be why he is not listed as their father. 1.6.1 Mary Ward Sparrowhawk, b. before 1831 at Aston, Oxfordshire, England. Baptized 29 May 1831 at St. Mary the Virgin, Bampton. d. 11 Dec 1832 in Aston, Oxfordshire, England. 1.6.2 Harriet Ward Sparrowhawk, b. before Dec 1832 in Aston, Oxfordshire, England. d. 21 Aug 1891 in Cote, Oxfordshire, England. Married: Alfred Townsend on 01 Aug 1853 in Shifford, Oxfordshire, England. Had issue. 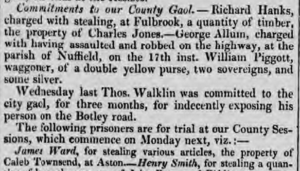 George Ward (1814-1901) also had a slight case of sticky fingers in 1832 when he stole fish from Thomas Rose of Shifford.16 His punishment was a whipping and 7 days in prison. The next year he was charged with stealing two half sovereigns and three half crowns17 from James Bedwell at Aston,18 but was acquitted.19 George was convicted of poaching by Rev Hyde at Aston in 1837. After spending two months in prison,20 he left Oxfordshire. The next place George Ward appears is his marriage to Mary Bridget McCann on 16 Sep 1839 at St. Mary the Virgin in Mortlake, Surrey.21 Mortlake is where my ancestor Thomas Ward (1813-1879) lived at the time. Thomas married his wife Mary Ann Maria Walters the year before in the same church.22 See a more detailed post about George Ward here: George Ward of Aston and Cote, brother of Thomas? 1.8.1 Mary Ann Ward, b. Sep 1840 at Mortlake, Surrey, England. d. 18 Jul 1841 in Mortlake, Surrey, England. 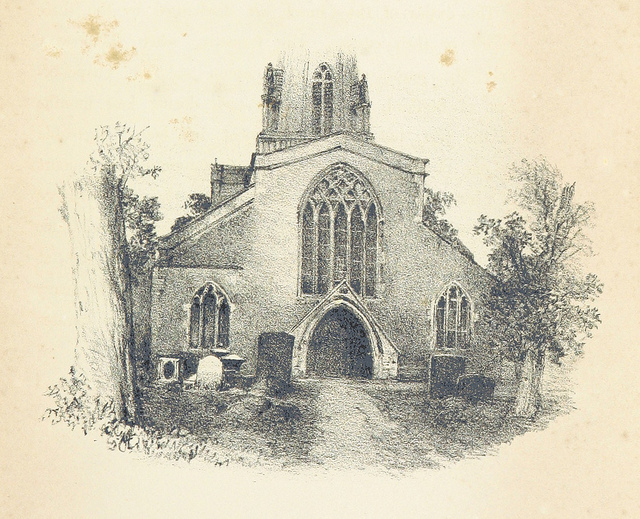 Buried 25 Jul 1841 at St. Mary the Virgin, Mortlake, Surrey, England. +1.8.2 Maria Ward, b. 10 Jul 1842 at New Richmond, Surrey, England. d. 27 Feb 1887 at Hudson, Charlevoix, Michigan, USA. Married: (1) Jeremiah Kirby, son of Jeremiah Kirby, on 17 Jun 1860 at St Peter’s Roman Catholic Church, Woolwich, Kent, England. Married: (2) William A Guerin on 04 Jun 1871 at Detroit, Wayne, Michigan, USA. Had issue with (1). 1.8.3 Margaret Ward, b. 16 Jun 1844 at Rope Yard Rails, Woolwich, Kent, England. d. 1845 at Great Spring Street, Shadwell, Middlesex, England. Buried 19 Aug 1845 at St. Paul’s Church, Shadwell, Middlesex, England. 1.8.4 James Ward, b. Nov 1846 at Great Spring Street, Shadwell, Middlesex, England. d. Jan 1848 at Great Spring Street, Shadwell, Middlesex, England. Buried 25 Jan 1848 at St. Paul’s Church, Shadwell, Middlesex, England. 1.8.5 Edward Ward, b. 19 Jan 1849 at Shadwell, Middlesex, England. d. 15 Aug 1920 at Merrill, Saginaw, Michigan, USA. Married: (1) Julia Gray on 02 Aug 1872 at Linden, Genesee, Michigan, USA. Married: (2) Eliza Ann Wood Gilson on 11 Oct 1882 at Saginaw City, Saginaw, Michigan, USA. Married: (3) Helen A Washburn on 11 Oct 1906 at Gratiot, Michigan, USA. +1.8.6 Agnes Ward, b. 05 Mar 1851 at Shadwell, Middlesex, England. d. 06 Jan 1915 at Linden, Genesee, Michigan, USA. Married: George W Brewer, son of William Ransom Brewer and Sarah J Stern, about 1870 in Michigan, USA. Had issue. David Ward (1835-1884) and Teresa’s widower Henry Townsend lived in the Witney workhouse as recorded in the 1851 Census. David appears as a workhouse resident in both the 1861 and 1871 Census returns as well. In 1871, there is a notation by his name that says: “Imbecile, 10 years.” David married Louisa Clements on 2 March 1876 at the age of 40. The 1881 Census shows him no longer a resident of the Workhouse. David and Louisa had six children, whom he supported by working as a licensed hawker. 1.15.1 David Alexander Ward, b. before 1831 at Aston, Oxfordshire, England. Baptized 27 Feb 1876 at St. Mary’s Church, Witney, Oxfordshire, England. d. 05 Nov 1834 at Witney, Oxfordshire, England. +1.15.2 Walter William Ward, b. 1878 at Witney, Oxfordshire, England. Baptized 27 Jan 1878 at St. Mary’s Church, Witney, Oxfordshire, England. d. 13 Jan 1941 at Witney, Oxfordshire, England. Married: Esther Tovey on 05 Aug 1899 at Cogges, Oxfordshire, England. Had issue. 1.15.3 Albert James Ward, b. 1879, baptized 25 May 1879 at St. Mary’s Church, Witney, Oxfordshire, England. d. Aug 1879, buried 14 Aug 1879 at St. Mary’s Church, Witney, Oxfordshire, England. 1.15.4 Emily Eliza Jane Ward, b. 1880, baptized 29 Aug 1880 at St. Mary’s Church, Witney, Oxfordshire, England. d. unknown. 1.15.5 Male Infant Ward, b. 1881 at Witney, Oxfordshire, England. d. 1881 at Witney, Oxfordshire, England. 1.15.6 Annie Rebecca Ward, b. 1883, baptized 05 Feb 1883 at St. Mary’s Church, Witney, Oxfordshire, England. d. unknown. 1.15.6 Florence Elizabeth Ward, b. 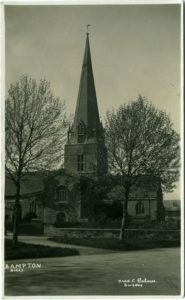 1885, baptized 07 Apr 1885 at St. Mary’s Church, Witney, Oxfordshire, England. d. unknown. Alfred Ward (1829-?) moved to Surrey after his mother’s death and found work as a Navvy. He lived in Woolwich working at the London Docks in the 1860’s where his older brother George Ward (1814-1901) had a greengrocer’s business and George’s wife Bridget ran an illegal pawnshop. Alfred had five children with a woman named Hannah Wadhams but they never married. Hannah was still legally married to her first husband Thomas Mee, whom she had left. Upon Hannah’s death, Alfred abandoned his children to the workhouse. The youngest four reverted to using the surname of their mother’s legal husband, Mee. +1.13.1 Edward Alfred Ward, b. 1865 at Christchurch, Southwark, London, England. Baptized 20 Jun 1873 at Christchurch, Southwark, London, England. d. 11 Mar 1945 at Epsom, Surrey, England. Married: Elizabeth Jessie Burton (daughter of Charles Burton) on 16 Jul 1893 at St John the Evangelist, Newington Walworth, London, England. Had issue. 1.13.2 Robert Ward, b. 1867 at Lambeth, Surrey, England. d. 1868 at Lambeth, Surrey, England. 1.13.3 Frederick Ward, b. 1870 at Lambeth, Surrey, England. d. 1869 at Lambeth, Surrey, England. +1.13.4 Alexander Ward [Mee], b. 18 Jun 1870 at Lambeth, Surrey, England. Baptized 20 Jun 1873 at Christchurch, Southwark, London, England. d. 10 May 1923 at Plumstead, Surrey, England. Married: (1) Elizabeth Ann Davis in 1894 at Gravesend, Kent England. Had issue. Married: (2) Hilda Gertrude Heymar in 1917 at Dewsbury, West Riding, Yorkshire, England. Had issue. +1.13.5 Herbert Frederick Ward [Mee], b. 13 Jun 1872 at 3 Boddy’s Bridge, Christchurch Southwark, London, England. Baptized 20 Jun 1873 at Christchurch, Southwark, London, England. d. 1942 at Bermondsey, London, England. Married: Maud Tufnell (daughter of John Tufnell) on 31 Mar 1901 at St Mary Magdalene, Southwark, London, England. Had issue. 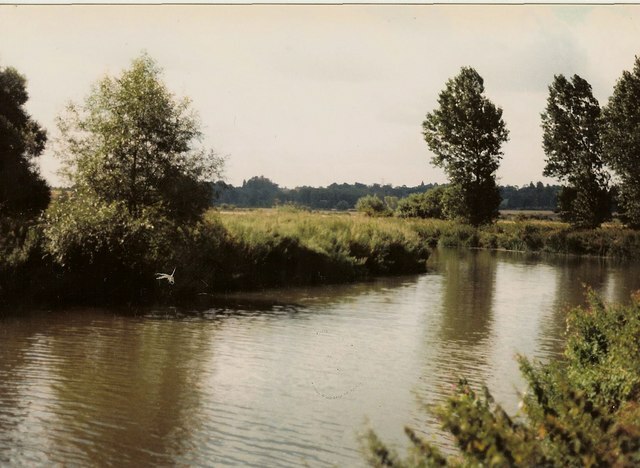 +1.13.6 Oliver Ward [Mee], b. 31 Jan 1874 at 74 Broadwell St, Lambeth, Surrey, England. baptized 05 Feb 1883 at St. Mary’s Church, Witney, Oxfordshire, England. d. 13 Nov 1953 at Bournemouth, Hampshire, England. Married: Sarah Jane Barker (daughter of Joshua Barker) on 03 Oct 1896 at St. Mary’s Church, Lambeth, London, England. Had issue. 1.13.7 William Henry Ward, b. 1876 in Lambeth, Surrey, England. d. 1877 in Lambeth, Surrey, England. +1.13.8 Rebecca Eliza Louisa Ward [Mee], b. 15 Jul 1878 at Lambeth, Surrey, England. baptized 07 Apr 1885 at St. Mary’s Church, Witney, Oxfordshire, England. d. 16 Jun 1955 at East Ernald, Hampshire, England. Married: Frederick Price (son of John Price) on 25 May 1896 at All Saint’s Church, Walworth, Surrey, England. Had issue. Oxfordshire Wards Part I: Thomas Ward, son of James. Which James? do you know Bampton then? I’ve not yet been to Bampton or Oxfordshire, I have just read a lot about the area when researching my family’s history.